Sony’s recorded music revenues hit $1.93bn in the first six months of calendar 2018 – up $200m (or 11.3%) on the $1.73bn posted in the same period of 2017. That’s according to MBW’s calculations based on Sony Corp’s newly-published results for its fiscal Q1 (calendar Q2) ended June 2018, converted into USD at constant currency. Sony Music’s streaming revenues in the first half of the calendar year reached $943.7m, up $265.3m (or 39.1%) on H1 2017’s tally of $678.4m. In calendar Q2 2018 (ie. the three months to end of June), Sony’s revenues reached $914.2m, up 1.7% year-on-year but down versus the previous two quarters. Within that figure, quarterly streaming revenues hit $478.1m in the calendar Q2 period, up 38.2% year-on-year. Physical music sales suffered a big decline in the quarter, falling 31.5% to $206.8m versus the $302m generated in calendar Q2 2017. Calendar Q2 2018 was affected to some degree, said Sony, by changes in its accounting practices. Sony Music’s biggest-selling albums/projects in the quarter (based on revenues) were led by three Sony Music Entertainment Japan (SMEJ) releases: (i) Nogizaka46’s synchronicity; (ii) Utada Hikaru’s Hatsukoi; and (iii) Keyakizaka46’s Hashiridasu Shunkan. Camila Cabello’s Camila album (pictured) was at No.4 with Dave Matthews Band’s Come Tomorrow at No.5. Sony Corp used today’s (July 31) financial update to announce that it had acquired the remaining minority stake in EMI Music Publishing, previously owned by the Jackson Estate, in a $287.5m deal. The Jackson Estate has relinquished approximately 10% of EMI Music Publishing to Sony as part of the agreement. Sony bought a 60% stake in EMP (to increase its overall holding to 90%) in a $2.3bn deal in May – a transaction which is now subject to regulatory approval. 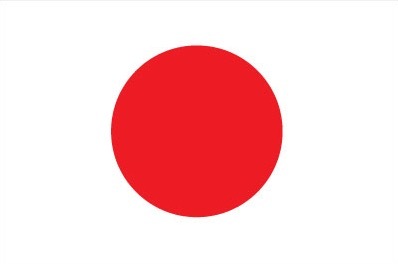 Sony Corp’s music publishing division – which includes Sony/ATV in addition to Sony’s separate publishing interest in Japan – posted revenues of 21.464bn Yen in the three months to end of June (fiscal Q1 / calendar Q2). That translates to a USD figure of $196.7m, and was up 29.7% at the constant currency dollar level on the same period in 2017 ($151.7m / 16.858bn Yen). Sony Corp’s overall music division includes recorded music, music publishing and ‘Visual Media & Platform’ (featuring runaway commercial success video game Fate/Grand Order). This division posted 177.708bn Yen in revenues for the calendar Q2 / fiscal Q1 quarter. At the dollar level, that figure translated to $1.66bn – up 9.6% on the $1.52bn (168.57bn Yen) posted in fiscal Q1 / calendar Q2 of the previous year. 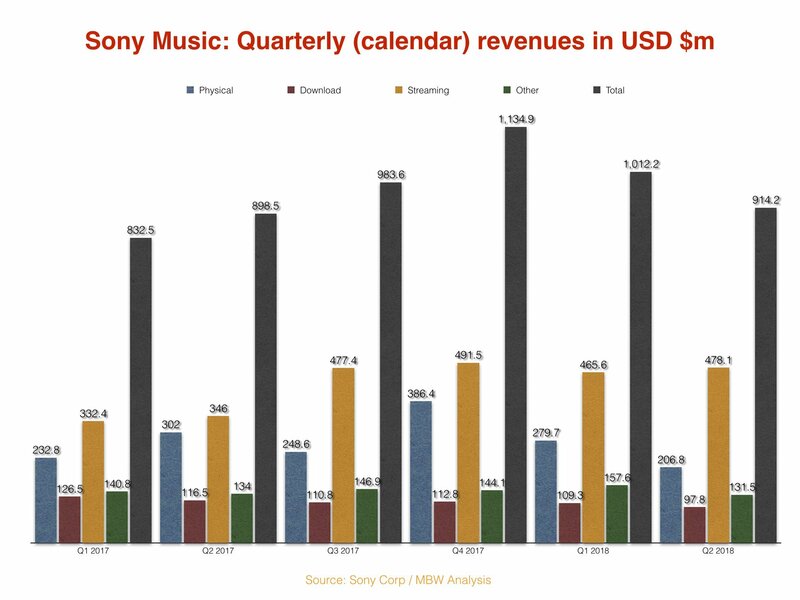 By applying these exchange figures to each applicable period, we effectively get a US-leaning constant currency picture of Sony Music’s performance. This isn’t a perfect system; it risks overplaying the major record company’s global business slightly by converting a chunk of revenues from Sony Music Entertainment Japan (which would usually be straight-reported in Yen) into US dollars. But it provides us with a cleaner reflection of the performance of New York-based Sony Music Entertainment outside of FX distortion – because the company had to convert its US currency into Yen in the first place for Sony Corp’s results. This is also believed to be the yardstick used internally at Sony Music Entertainment’s HQ in New York. 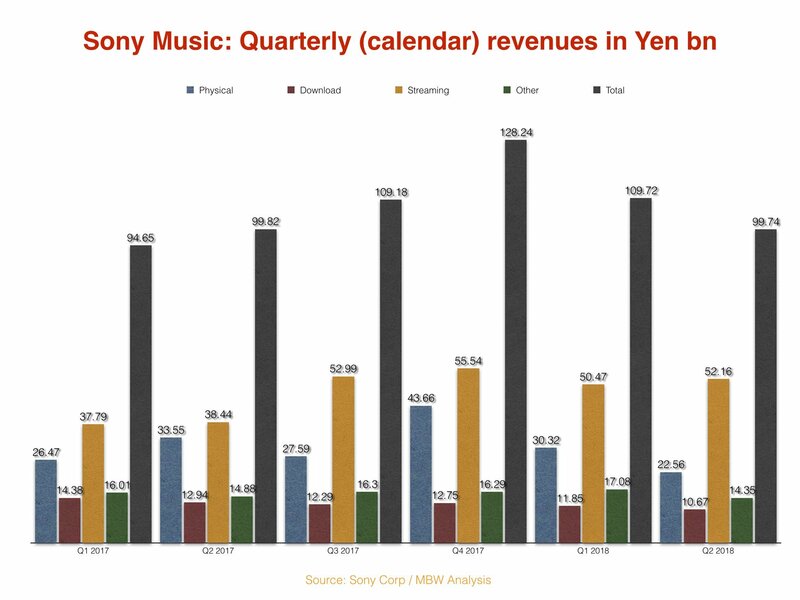 See below for a table and chart showing Sony Music’s recent quarterly revenue breakdown at the Yen level.